The most exciting and challenging part of my job this semester is teaching the Satellite Program, a 30-year-old program meant to introduce high school students to Western art history. Not only do I have big shoes to fill (Chief Educator Barbara Brown Lee passed the Satellite torch to me this year), but I also have a couple of big questions to consider: How do I teach a solid, but fun, overview of art history using the Museum’s collection as our textbook? How can I incorporate new technology into the class to enhance our looking experience, and not distract from the artwork? The newest addition to the program is an iPad (see above)! I have a deep interest in bringing new technology to the Museum, and exploring the possibilities of the iPad in the Museum feels nothing less than groundbreaking. But since I tend to be more of a “purist” in my style of gallery teaching–I was trained not to bring any extraneous materials like books or reproductions along–having the iPad is also a challenge; its incredible arsenal of resources to an art historian–from a basic Google Image Search to downloadable ArtBabble videos from museums around the world–is both tempting and overwhelming. The students, a class of fourteen talented and passionate young adults, are a willing group for this pilot iPad project. We look in depth at two to three works of art each class, discussing as a group what each can tell us about the culture that made the piece. We use the iPad to show videos, interactive maps, and/or related works of art (that don’t live in the Milwaukee Art Museum Collection), as well as debrief our discussion through a simple blog, where one student volunteers to “scribe” on the iPad and summarize and tag each artwork at the end of class in a post. Nardo di Cione. Madonna and Child, ca. 1350. Milwaukee Art Museum, Purchase, Myron and Elizabeth P. Laskin Fund, Marjorie Tiefenthaler Bequest, Friends of Art, and Fine Arts Society; and funds from Helen Peter Love, Chapman Foundation, Mr. and Mrs. James K. Heller, Joseph Johnson Charitable Trust, the A. D. Robertson Family, Mr. and Mrs. Donald S. Buzard, the Frederick F. Hansen Family, Dr. and Mrs. Richard Fritz, and June Burke Hansen; with additional support from Dr. and Mrs. Alfred Bader, Dr. Warren Gilson, Mrs. Edward T. Tal, Mr. and Mrs. Richard B. Flagg, Mr. and Mrs. William D. Vogel, Mrs. William D. Kyle, Sr., L. B. Smith, Mrs. Malcolm K. Whyte, Bequest of Catherine Jean Quirk, Mrs. Charles E. Sorenson, Mr. William Stiefel, and Mrs. Adelaide Ott Hayes, by exchange. We’ve had two classes so far and I’m already adjusting my plans. Most students in the class have a solid background in art history already, having taken AP Art History courses, so it’s a delicate balance to both use their knowledge and help them discover something new. As cool as the blog portion is, it interrupts the flow of the class, since it takes time to type on the device and our group summarizing can feel a little repetitive. So I’m looking for a better solution to debrief—perhaps condensing it to just tagging the works of art instead. The best teaching moment this week was when we looked at Nardo di Cione’s Madonna and Child (right). We started with a “pair share”, each of us silently focusing on a single detail of the painting and then describing it to a partner. 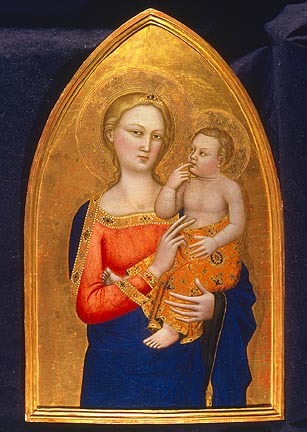 Coming together, we discovered that nearly everyone had touched on a different part of the work, and as a result unearthed key ideas—like the relationship between the two figures, the piece’s sumptuous materials, and its curious style, a rare cross between Byzantine and Early Renaissance. 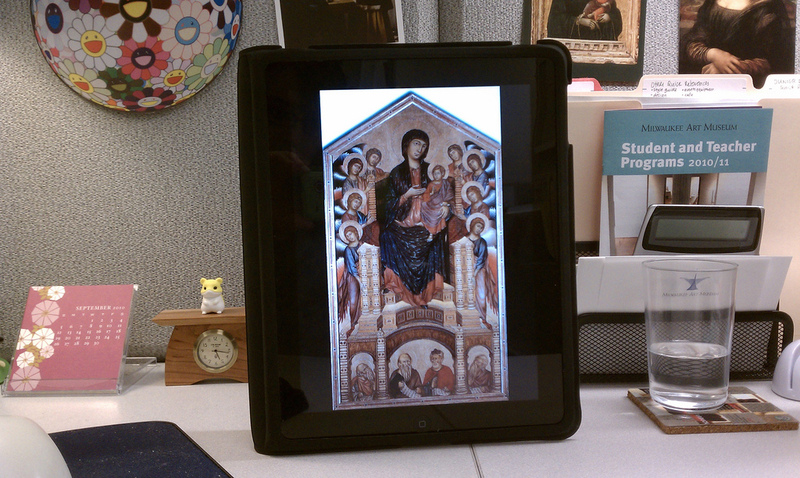 We used the iPad to compare it with Cimabue‘s Byzantine-style Madonna and Child from the Uffizi Gallery in Florence, Italy (pictured above on the iPad). As we zoomed in on the iPad to look at the angular folds in the robe of Cimabue’s Madonna—so different from Nardo’s, right next to the screen—a collective “ooh, this is so cool” rose from the group. Moments before, we’d watched a 3-D video on mummification to understand how the Museum’s Mummy Coffin was made, and the class’s attitude was decidedly less enthused. Seems like simplicity might be the key, and something to explore in the weeks to come in the Satellite Program. This entry was posted in Education and tagged Gallery Teaching, Satellite High School Program. Bookmark the permalink. 1 Response to Satellite: It Begins!